"Queen of France" redirects here. For the ship, see USS Queen of France. Marie Antoinette, queen consort of Louis XVI, was beheaded during the French Revolution. This is a list of the women who have been queens consort or empresses consort of the French monarchy. All monarchs of France were male, although some women have governed France as regents. 53 women were married to French monarchs: 49 queens and three empresses. Ingeborg of Denmark and Anne of Brittany were each queen more than once. Marie Josephine Louise of Savoy was queen de jure during the Republican and Imperial periods, but never wife of the de facto head of the French state. From 1285 to 1328, the crowns of Navarre and France were united by virtue of the marriage of Joan I of Navarre to Philip IV of France, and by the succession of their three sons, Louis X, Philip V, and Charles IV. Thus, the wives of these three kings were queens consort of Navarre as well as of France. With the death of Charles IV, however, Navarre passed out of the hands of the French kings until 1589, when Henry III of Navarre became Henry IV of France. Upon Henry IV's succession, his wife, Margaret of Valois, who was already queen consort of Navarre, also became queen consort of France. Thereafter, until 1791, queens of France were also queens of Navarre. The crown of Navarre merged with the French crown in 1620, but the French kings continued to call themselves King of Navarre until 1791. The title of King of Navarre was reassumed with the Restoration of 1814–15, but dropped with the Revolution of 1830; the Bonaparte and Orléans consorts did not use it. 1248–1252: During the absence of her son Louis IX on crusade. Joan the Lame, who often governed for her husband Philip VI whilst he was fighting. Isabeau of Bavaria (inconsistently between 1393–1420), during the insanity of her husband Charles VI, during which she vied for power with her husband's uncles and brothers. Empress Eugenie, three times for her husband, Napoleon III, during his absence. Madame de Maintenon, mistress of Louis XIV, married the king in the winter of 1685–1686 privately by François de Harlay de Champvallon, archbishop of Paris, in the presence, it is believed, of Père la Chaise, the king's confessor, the Marquis de Montchevreuil, the chevalier de Forbin, and Alexandre Bontemps. Owing to the inequality of social status, she and the King did not marry openly (which would have allowed her to become queen). No written proof of the marriage is extant, but that it took place is nevertheless certain. It is important to remember that Madame de Maintenon was never queen of France, simply a royal consort. Bertha of Burgundy Conrad of Burgundy c. 952 996 1000 1035? Margaret of Burgundy Robert II, Duke of Burgundy 1290 23 September 1305 29 November 1314 uncrowned 15 August 1315 Louis X Imprisoned during her husband's reign due to the Tour de Nesle Affair. Arms unknown. Blanche of Burgundy c. 1296 1308 3 January 1322 uncrowned 19 May 1322 April 1326 Charles IV Imprisoned during her husband's reign due to the Tour de Nesle Affair. Arms unknown. This is a list of the kings and queens of Aragon. The Kingdom of Aragon was created sometime between 950 and 1035 when the County of Aragon, which had been acquired by the Kingdom of Navarre in the tenth century, was separated from Navarre in accordance with the will of King Sancho III (1004–35). In 1164, the marriage of the Aragonese princess Petronila and the Catalan count Ramon Berenguer IV created a dynastic union from which what modern historians call the Crown of Aragon was born. In the thirteenth century the kingdoms of Valencia, Majorca and Sicily were added to the Crown, and in the fourteenth the Kingdom of Sardinia and Corsica. The Crown of Aragon continued to exist until 1713 when its separate constitutional systems were swept away in the Nueva Planta decrees at the end of the War of the Spanish Succession. This is a list of the kings and queens of Pamplona, later Navarre. Pamplona was the primary name of the kingdom until its union with Aragon (1076–1134). However, the territorial designation Navarre came into use as an alternative name in the late tenth century, and the name Pamplona was retained well into the twelfth century. Philip III, called the Bold, was King of France from 1270 to 1285, the tenth from the House of Capet. A regent is a person selected to act as head of state because the ruler is a minor, not present, or debilitated. Currently there is only one ruling Regency in the world, sovereign Liechtenstein. The following is a list of regents. Joan I of Navarre was queen regnant of Navarre and ruling countess of Champagne from 1274 until 1305; she was also queen consort of France by marriage to Philip IV of France. She was the daughter of king Henry I of Navarre and Blanche of Artois. This is a list of Swedish queens consort and spouses of Swedish monarchs and regents. The list covers a large time span and the role of a consort has changed much over the centuries. The first Swedish consorts are spoken of in legends. The consorts until c. 1000 are often semi-legendary, as are the monarchs. Between the 14th and 16th century, during periods of de facto Swedish independence from the formal union with Denmark, the Swedish regents did not have the title of king or queen, nor did the spouses of kings have the title of queen consort, although they had the equivalent position. Due to unions with Finland, Denmark and Norway, many of the Swedish consorts were also consorts of monarchs of those countries. Consorts listed during the period of 1380–1520 were in fact also consorts to monarchs of Denmark. The consorts listed during the period of 1814-1905 were also consorts to monarchs of Norway. Finland was from the Middle Ages a part of Sweden, and although there was no official title, such as "Queen Consort of Finland", from the 16th century until the year of 1809, the queen consort of Sweden also held the title "Grand Princess of Finland." Charles of Valois, the third son of Philip III of France and Isabella of Aragon, was a member of the House of Capet and founder of the House of Valois, whose rule over France would start in 1328. 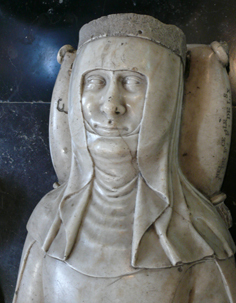 Joan II was Queen of Navarre from 1328 until her death. She was the only surviving child of Louis X of France, King of France and Navarre, and Margaret of Burgundy. Joan's paternity was dubious because her mother was involved in a scandal, but Louis X declared her his legitimate daughter before he died in 1316. However, the French lords were opposed to the idea of a female monarch and elected Louis X's brother, Philip V, king. The Navarrese noblemen also did homage to Philip. Joan's maternal grandmother, Agnes of France, Duchess of Burgundy, and uncle, Odo IV of Burgundy, made attempts to secure the counties of Champagne and Brie to Joan, but the French royal troops defeated her supporters. After Philip V married his daughter to Odo and granted him two counties as her dowry, Odo renounced Joan's claim to Champagne and Brie in exchange for a compensation in March 1318. Joan married Philip of Évreux, who was also a member of the French royal family. 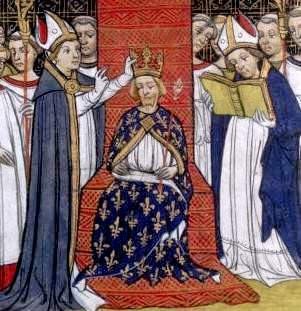 The House of Capet or the Direct Capetians and, also called the House of France, or simply the Capets, ruled the Kingdom of France from 987 to 1328. It was the most senior line of the Capetian dynasty – itself a derivative dynasty from the Robertians. Historians in the 19th century came to apply the name "Capetian" to both the ruling house of France and to the wider-spread male-line descendants of Hugh Capet. Contemporaries did not use the name "Capetian". The Capets were sometimes called "the third race of kings". The name "Capet" derives from the nickname given to Hugh, the first Capetian King, who became known as Hugh Capet. Beatrice of Savoy was the daughter of Thomas I of Savoy and Margaret of Geneva. She was Countess consort of Provence by her marriage to Ramon Berenguer IV, Count of Provence. Clementia of Hungary was queen of France and Navarre as the second wife of King Louis X. This is a list of those men and women who have been royal consorts of the Kingdom of Navarre. Because the laws of Navarre did not prohibit women from inheriting the crown, on a number of occasions, the Kingdom was inherited or transmitted via heiresses. Thus, whilst most of the royal consorts were women, who held the title of queen consort, several were men, who by their marriages held the title of king, and who are given regnal designations in the lists of Navarrese kings and queens regnant. The English royal consorts were the spouses of the reigning monarchs of the Kingdom of England who were not themselves monarchs of England: spouses of some English monarchs who were themselves English monarchs are not listed, comprising Mary I and Philip who reigned together in the 16th century, and William III and Mary II who reigned together in the 17th century. This is a list of consorts of the monarchs of the Kingdom of Aragon. Blanche II of Navarre and Philip I of Castile died before their spouses inherited the crown. Jeanne d'Albret, also known as Jeanne III, was the queen regnant of Navarre from 1555 to 1572. She married Antoine de Bourbon, Duke of Vendôme, and was the mother of Henri de Bourbon, who became King Henry III of Navarre and IV of France, the first Bourbon king of France. She became the Duchess of Vendôme by marriage.